Devoid Of Culture And Indifferent To The Arts: Gardening: Why are many things I love quasi-illegal? Gardening: Why are many things I love quasi-illegal? I thought that title would get your attention. This is a bit of a strange entry because it’s for a beautiful self-seeding garden flower, Papaver somniferum which is illegal in some countries. Somniferum has two non-Latin names. 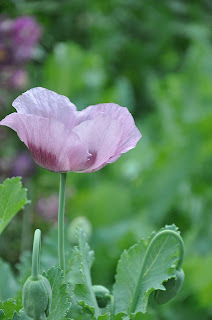 The first is the Common Garden Poppy. 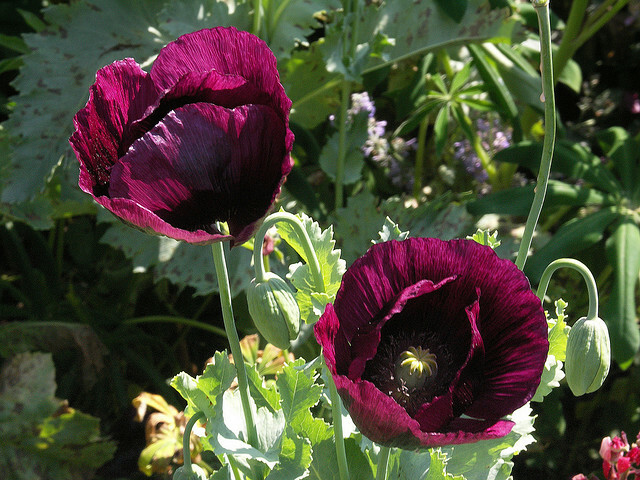 Opium poppies can grow to a height of about 3 feet and range in colours from white to flaming red, through purples to nearly black. They also come in single and double flowered varieties. 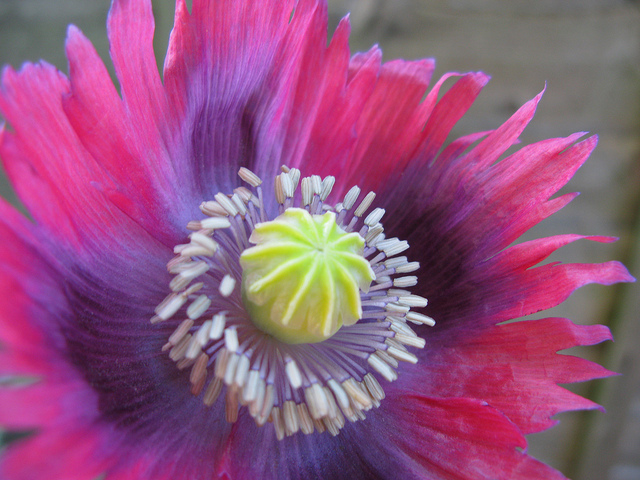 Most opium poppy plants have more than one blossom per stalk. They are easy to identify by their grey green, wide and very smooth foliage. Opium poppies grow in all parts of Canada except for Labrador and the northern territories. In the USA there are only a few states that do not have populations. Papaver somniferum is the species of plant from which both opium and culinary poppy seeds are harvested. 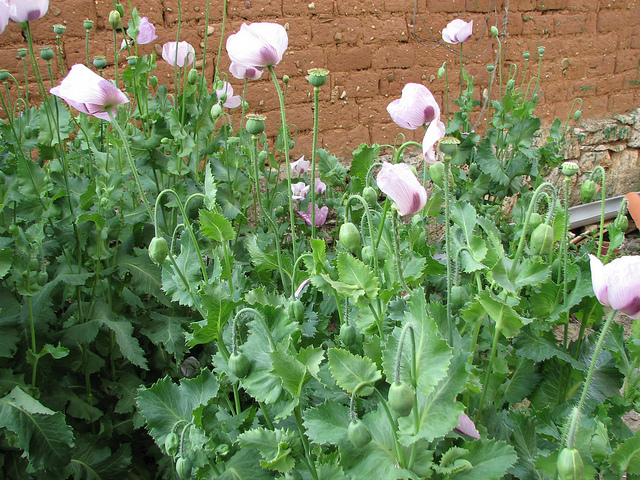 Opium is the source of morphine, thebaine, codeine, papaverine, and noscapine. Somniferum means "sleep-bringing" because of the sedative properties of opiates. Seeds of papaver somniferum are an important food item and the source of poppy seed oil, a healthy edible oil. The seeds themselves contain very little of the opiate. In an episode of MythBusters (US television show) they did proved you could test positive for opiates if you ate four poppy seed bagels. So you’re warned. But you can collect the seeds for baking. Each seed head contains thousands of small black seeds. When ripe the dried seed pods open up with a series of little square holes around the top and wind gusts will shake the pod "baby rattle" like to scatter the seeds. To use the seeds they need to be ripe, so tie small bags around the seed heads when they starts to turn brown. The flowers and plants are among the most beautiful poppies. If you want to grow them you can purchase seeds for many different colours. You should check to see if it’s legal to grow them in your country. For example, in the UK you can grow them but can’t make opium (of course).In Italy it’s much the same story, as is true in Canada, In the USA they are a controlled substance, but no one has been charged with growing a few in their garden. Other countries are not as lenient. In the United Arab Emirates a man was reported to be imprisoned for seeds that were on a bread roll. Regardless, they are a beautiful plant and I suggest, if you can, you should include some in your garden. Many varieties can be purchased through Chiltern Seeds in the UK. They currently have 14 in their catalogue. Their site is http://www.chilternseeds.co.uk/.